The three motorbikes twisted around sharp turns, bumping over potholes, as their riders navigated the narrow alleyways of Rastan with their lights off, before heading out into the pitch-black fields beyond this Syrian town, 12 miles (20 km) south of the recently smothered rebel city of Hama. They pulled out AK-47s (wrapped in sacks and towels) as soon as they had passed populated areas, but they continued in the dark to avoid detection by the Syrian security forces stationed nearby and their informants. "Make sure your safety is off," my guide, the lead driver, told the others as he wrapped the strap of his weapon around his leg before placing the AK-47 on his lap. It was late at night and my colleague and I, a French-Moroccan documentary filmmaker, were heading to a safe house almost an hour away to interview eight Syrian military defectors who were fearful of being captured. They had ample reason to be afraid: just 48 hours earlier, there were nine of them. 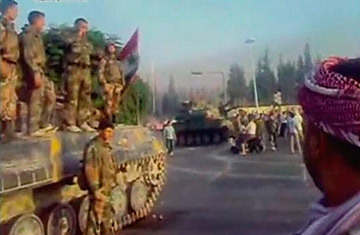 The group of soldiers, all of whom were lieutenants from Rastan, had mainly been stationed in the southern city of Dara'a, where the antiregime uprising erupted in mid-March, as well as in the capital of Damascus. The men had each escaped from their various deployments and returned to their hometown. Two days before TIME visited them, they had donned their uniforms again to publicly announce their defection as a group in a brief, boilerplate video statement that was uploaded to YouTube and later aired on al-Jazeera. They made individual videos too, like a 48-second clip showing First Lieutenant Fadi Kism, a bearded man with dark eyes and plump lips, announcing his defection from the army's Third Division. "I'm doing it because of the destruction that I saw in Rastan, and in Homs, in Dara'a and Hama," the 23-year-old tells the camera. The next day, around 1 p.m., shortly after his mother had watched the video of Rastan's defectors on al-Jazeera, Kism was dead, killed in an ambush by loyalist soldiers who had tricked him and his colleagues into thinking they wanted to join them. A firefight broke out, the defectors say, in an account verified by several civilian witnesses interviewed independently. The official Syrian news agency SANA ran a short piece the next day saying that "an armed terrorist group" had "set an ambush, four kilometers east of Rastan city, opening fire on a convoy carrying officers to their workplaces." An officer and two soldiers were killed, the report said, adding that three loyalists were wounded. "We only protected ourselves," says Lieutenant Ibrahim Mohammad Ayoub, one of the remaining eight defectors. "We are not interested in attacking unless civilian lives, or our lives, are in danger." The defectors say they are being hunted down by a regime that won't forgive disloyalty. They insist they are only protecting their townsfolk, but it seems like they themselves are in need of protection. There are reports, difficult to verify, of soldiers being killed by their colleagues for refusing to shoot protesters. Low-level military defectors are breaking away in small numbers, but there have been very few high-ranking deserters, largely because the military's upper echelon is made up of officers from the same Alawite minority sect that President Bashar Assad belongs to. TIME spoke to one of the most senior defectors, Colonel Hussein Harmoush, in northern Syria in June, just hours before he crossed into Turkey. Harmoush now claims to speak for the so-called Free Syrian Army (FSA), a loose grouping of defectors that is reportedly headed by Colonel Riad al-As'ad, whose whereabouts are unclear. Still, beyond a few amateur video statements  which encourage other soldiers to desert and offer promises to protect civilians  there is precious little proof of the FSA's existence, at least in any regimented form. The lieutenants in Rastan appear to have been left to their own devices, and most of them seem just fine with that. "We are not part of any command. We are not with Harmoush or anyone else," says Lieutenant Abdel-Razak Tlass. "We are officers, and we make and take our own orders." They are proud of Harmoush and al-As'ad, but they say they don't obey them. "They have higher ranks, but they're just like us," says Yaroub Marwan Taktak. That pique may be explained by the fact that the highest-ranking defectors are believed to be overseas, a sore point with all eight officers. "What is the point of being overseas? We need them here in Syria," says Lieutenant Amjad Mohammad Hamid. "We have no communication with officers outside Syria," says Taktak. "We are officers. We are supposed to protect our people here." Still, says one of the defectors diplomatically, "we are just in the early stages. We are still trying to organize ourselves." The question is, into what? Defectors interviewed by TIME, both in Rastan and elsewhere, all stress that their weapons are used for defensive, not offensive missions. They also say they do not want armed civilians to join their ranks. Even if defections increase as more Syrian cities erupt in antiregime anger, further stretching a loyalist military struggling to contain a five-month rebellion that shows few signs of being cowed, what will this corps of defectors do? Will it be big enough, and contain sufficient names and high ranks, to prompt the military to switch sides, as was the case in Egypt against Hosni Mubarak and in Tunisia against Zine el Abidine Ben Ali? The coming weeks, months and perhaps years will answer these questions. For now, it seems the most these small groups of defectors can do is save a few citizens, and maybe themselves. They remain vulnerable to retribution, as the lieutenants in Rastan are painfully aware. Kism was buried before sundown, hours after he was killed and just a day after publicly announcing his defection. He was placed in the ground wearing a blood-soaked green T-shirt and jeans, in keeping with the Islamic funeral rite of burying a martyr in the clothes he died in. "To heaven we are going, martyrs in our millions," an angry crowd chanted at Kism's graveside. "Death but not humiliation." "Syria is ours, it's not for the Assad family." Kism's grief-stricken mother, Em Fadi, said her son hated the army. She knew he wanted to leave but tried to dissuade him, fearing he would be killed. "He was killed anyway," she said, holding her head in her hands as she rocked back and forth, mourning the eldest of her four sons. "May their hearts burn the way they have burned mine," she says. Kism was going to be sent to Deir ez-Zor, a Syrian town that has since been attacked and besieged by the military. Her son defected just five days before he died, Em Fadi said. "He told me he wanted to join the free officers, that he'd rather die with them than have to shoot people." His first child is due in August. On the way back from interviewing the defectors, the armed motorbike riders, who offer little information about themselves beyond that they serve as the "intelligence wing" of Rastan's small unit of army deserters, senses trouble. Another motorbike is following us. They quickly pull over and brandish their weapons. The suspect is a young man in military pants and a civilian shirt. He claims that he is checking on his nearby property. After several tense moments, he is allowed to continue, but one of the "intelligence agents" isn't convinced. "His accent was odd," he says, but the others persuade him to forget it. The next day, shortly after 10 a.m., the telephone network in Rastan, both cellular and landline, cuts out, along with the Internet. Tanks soon roll into parts of the town, focusing on the region beyond the fields, where the safe house is. The officers quickly fled, I am told, to find safety elsewhere. See pictures of Syrians fleeing into Turkey.